Wellington 3-Arc Floor Lamp Shed some stylish light on your living space with the Wellington 3-arc floor lamp. Adjustable arms give you endless options to position the 3 drum shades, and the neutral color blends seamlessly with any decor. Shed some stylish light on your living space with the Wellington 3-arc floor lamp. Adjustable arms give you endless options to position the 3 drum shades, and the neutral color blends seamlessly with any decor. H: 91" Shade Dimensions: Top W: 14.5" x Bottom W: 14" x H: 8"
Rotary switch operates each light individually or all 3 at the same time. My apartment is very dark, this lamp has given the new furniture a bright clean look. It's very modern and I love it. Lights look amazing in our living room. You can run them as straight long or alternate the arms to create depth. The base is quite heavy and it was missing a washer but overall I love the light. Best Lamp I ever purchased, so excited on getting the room all set with this lamp. 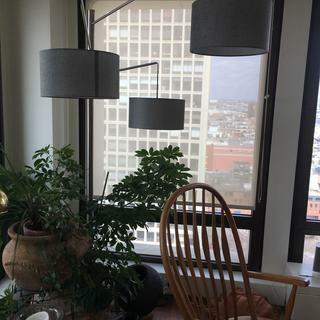 So happy I finished off the whole living room set with this lamp. Lamp arrived and when we assembled it we found it scratched and marked. The store replaced it with a new one without hesitation and now very happy with our purchase. The minute I saw this unique lamp with three shades, I had to have it. We have no lighting in the living room and it gives off a lot off light and looks great. Very sturdy, easy to assemble, and stylish! Sturdy. Beautiful. Understated. Stylish. Very happy with the look and the way it lights up that corner of the room without spoiling our views of Philadelphia. Looks great and easy to assemble — great addition to our living room ! Very sleek and modern. Brings the whole room together. Fantastic lamp for rooms with tall ceilings. The gray shades add some personality without affecting the light output. Highly recommend! I love this piece, once I saw it in the showroom i knew IT would be perfect for my living room. I hooked it up with hue light bulbs. It’s tall and very sturdy with a modern look. Would suggest. I'ts a little tall. I have 7 1/2 foot ceiling, and the tallest pole is flexed slightly against the ceiling. Still it looks great. Only complaint is that the Knob feels a little cheap. These lights are beautiful and the shades are exactly as pictured. I am so delighted with my lamp! Love, Love, this lamp!!!! We have this light in our living room. It is more than enough to light the entire room (3 x 100 watt-equivalent bulbs). The only negative is the pole leans towards the lights by about ten degrees. Not a deal breaker, but we would prefer it to be vertical. Do the arms rotate or are they stationary? BEST ANSWER: Yes, the Wellington 3- Arc Floor Lamp does have adjustable arms give you endless options to position the 3 drum shades. How far out does the top (largest) arc come out from the wall? BEST ANSWER: Including the shade, the top arc is 71" away from the wall. Is that the only color the shades come in? 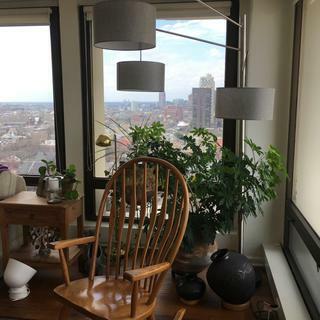 BEST ANSWER: The Wellington 3-Arc Floor Lamp shades are available as shown only.